I can’t have a Monstrous Tuesday; it’s not alliterative! But here I am, doing nothing but read other blogs or look at Facebook when I meant to be making today’s post. I should perhaps mention I am having a dreadful bout of Writer’s Blank. 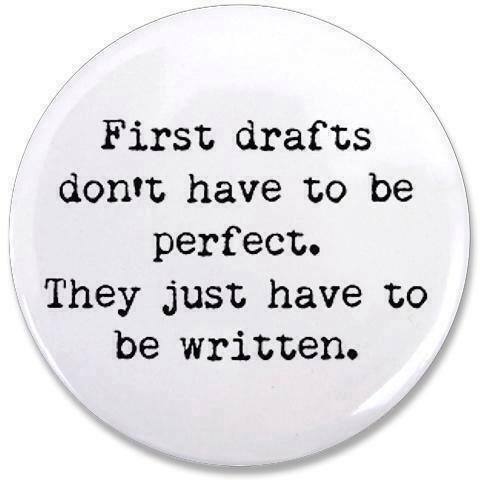 At least, maybe this time it really is Writer’s Block, because there are words in my head that I intend to write. Only when I sit down and put pen to paper, nothing comes out. 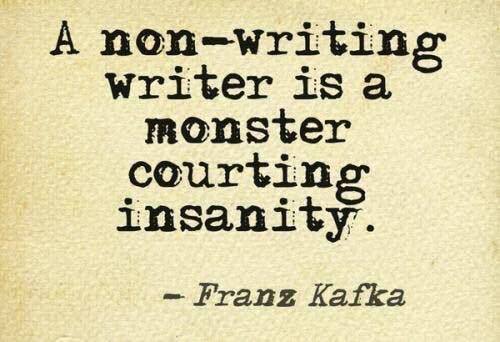 I found this gem by typing “monsters writing” into the search bar on Facebook. Maybe it really is a discipline thing. Perhaps if I gritted my teeth and forced myself to write the words I was thinking… Look, I already get sore muscles in my temples from grinding my teeth in my sleep, I do NOT need any more teeth gritting. I really did sit down and write a sentence, which I immediately hated. Oh, it was not the sentence you see at the top of this post. I was trying to write my articles for Mohawk Valley Living magazine. I imagine this was done with some gritted teeth. I seem to follow a pattern with almost everything I write: I can’t write it, I can’t write it, I can’t write it, I sit down and write it. And I have yet to figure out how to skip any of the “I can’t write it”s. I like to think the picture above is what might result if I tried. For the uninitiated, it is from the 1980 movie The Shining, adapted from the Steven King book (by the way, they changed a LOT). The main character is a writer, and this is all he has managed to come up with. And now here I am approaching 300 words after I thought I couldn’t write at all. So I guess that is one solution: if you can’t write one thing, try something else. Maybe I will be able to segue over to my articles next. In the meantime, I’m going to call this a Tired Tuesday and drive on. 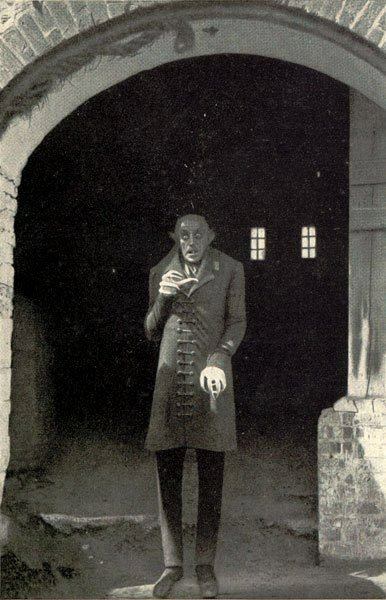 Maybe one picture of Nosferatu, just to cheer myself up. Posted in humor, personal, Tired Tuesday, writing and tagged blog post, blogging, Mohawk Valley Living magazine, monsters, Monstrous Monday, Nosferatu, not writing, Writers Blank, Writers Block, writing. Bookmark the permalink. If you tuned in today hoping to read an inspirational post about how miraculously I upped my game today, as I said I was going to do yesterday, I am afraid you will be disappointed. However, if you were hoping for a foolish Tired Tuesday post, you came to the right place! In point of fact, I feel I did up my writing game somewhat. I wrote two articles for Mohawk Valley Living magazine. I’m letting them set before I re-read them and email them out. However, I did not up my running game, my house cleaning game, or any other game in which I participate. Well, one thing at a time, one thing at a time. I do not know why I am so damn tired. Yes, I worked all day. I work five days a week, as do many people. I worked eight hours, again, as do many people. I am actually hoping to get a little overtime in the near future, so I guess I don’t know what the hell I’m thinking. You know, looking over what I have written for this blog post so far, I think I had definitely better re-read those articles before I email them out. They might be TERRIBLE! 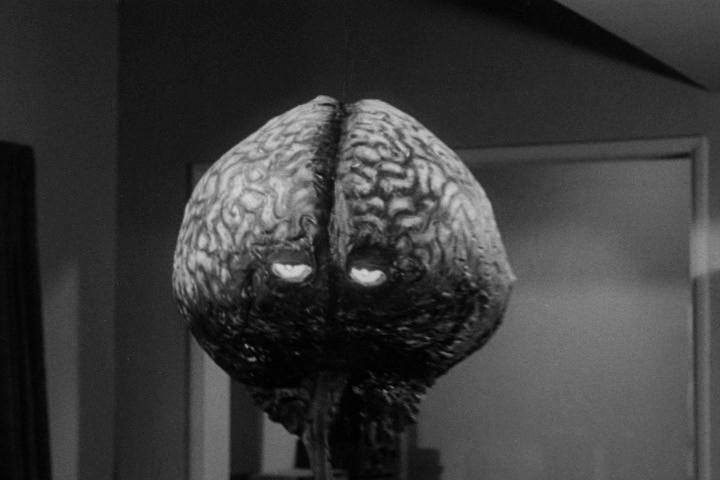 Brain, oh brain, where are you now? I thought I’d throw in a picture quick, to distract my readers from the lameness of this post. A timely reminder for me. Before writing this foolishness, I enjoyed a post by a blogger I follow, Granny K. She philosophized about Tuesday, saying it was a sad day. I feel a little sad myself. Let’s all try for a better day on Wednesday. Posted in humor, personal, Tired Tuesday and tagged articles, blog post, blogging, Mohawk Valley Living magazine, not writing, upping my game, writing. Bookmark the permalink. Wuss Out or Shout Out? It is Wuss-out Wednesday, I’m afraid, but I hope to add a modicum of worthiness to the proceedings with a shout-out to a local business, the Miners’ Table in Herkimer, NY. Steven and I first went to the Miners Table on a recent Sunday, and I hope to write an article about it for Mohawk Valley Living magazine. In fact, I have started writing the article. Full disclosure: I could have finished writing the article without returning to the place, but I wanted to go out. So did Steven. So we went. We sat at the bar, as we did before, and ordered drinks and an appetizer. I wandered around the restaurant with my Tablet, taking a few pictures. I will submit the pictures with the article. I suppose I could also use them in this post, but, like I said, this is Wuss-out Wednesday. It was a fun interlude for mid-week. We chatted a little with the bartender. She said it was a great place to work, where they treat their employees well. I told Steven he should apply for a job. The appetizer we got, Hammer and Chisel Nachos, was as substantial as a meal. I understand most people order it as a four-person appetizer, but I think it would still be pretty substantial. The wine was tasty too. The Miners’ Table is located at the Herkimer Diamond Mines, 4579 State Rt. 28, Herkimer, NY, 315-891-3463. Posted in humor, local business, personal, Wuss Out Wednesday and tagged appetizers, blog post, blogging, dining, Herkimer Diamond Mines, herkimer ny, Miners Table, Mohawk Valley Living magazine, nachos, restaurant, wine. Bookmark the permalink. I think this post is going to be time-stamped Valentine’s Day, but as I type this, it is Feb. 13. I just returned from Little Falls, NY. I went to Huckleberry Letterpress Co. to purchase a Valentine for Steven. I felt very fortunate when I saw on their Facebook page that they were open at the beginning of the week for Valentine’s shopping. Now I feel bad that I did not plug them yesterday, so local readers may have had a chance to go there today. No matter. You can go there another day to get a different kind of card. They have an excellent selection. I wrote about Huckleberry Letterpress for the February issue of Mohawk Valley Living magazine. They were also featured on the Sunday Mohawk Valley Living TV show. (Back to present time): I decided to share those paragraphs, because, you know, waste not, want not (ooh, I do remember thinking, “waste not, want not” earlier, that was worth remembering). Also, I had linked to the shop and the magazine. After I typed in what I could, I felt really bad for not doing more for Valentine’s Day for my husband (I had declared we would celebrate it on Fat Tuesday, because Steven works later today), so I bestirred myself to go out to the kitchen and bake brownies. I used a mix and added chocolate chips. Steven liked them, and he liked the card. So I guess this is yesterday’s post. I see it is clocking in over 450 words. Yay me. Kind of. Happy Valentine’s Day. Posted in humor, personal, Tired Tuesday and tagged blog post, bloggers sick day, blogging, Huckleberry Letterpress Co, Mohawk Valley Living magazine, not writing, notebook by your bed, Valentine's Day, writing. Bookmark the permalink.